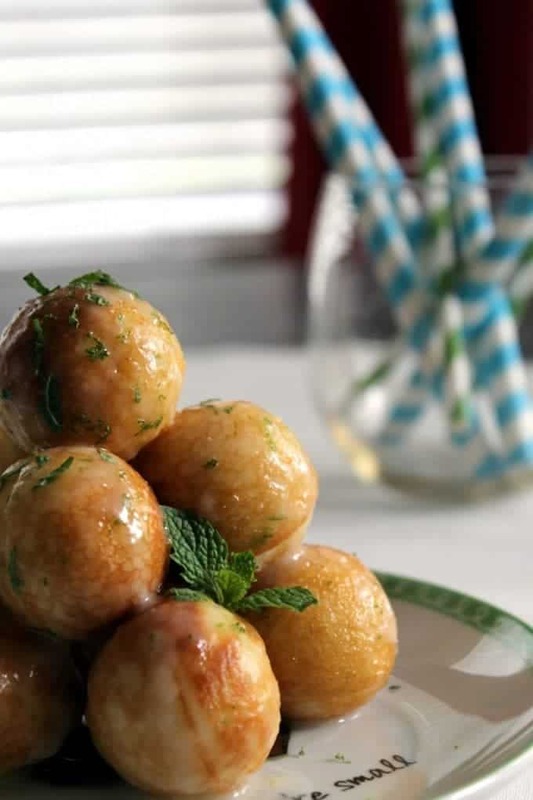 These ginger lime Moscow Mule doughnut holes are glazed with lime and mint to remind you of the Moscow Mule cocktail that you love to drink! Two years ago my friend Nina gave me a doughnut hole maker for my birthday and much like all my other kitchen gadgets, I’m sorry to say, I used it a few times and then it got stuck in my appliance garage. By garage, I mean the closet in the hall by the kid’s playroom, because the total square footage of kitchen counter space I have is equal to a piece of notebook paper. Being that I like to cook, I have more than one garage in my house: the appliance garage, the platter garage, the snack garage, baking garage. Funny that I do not have an actual garage for my car. Anyway, I love the doughnut hole maker and felt guilty that I don’t use it more often so I have been trying to come up with recipes to make in it. The speed in which it cooks is faster than Road Runner so it would be perfect for breakfast! What could be better for breakfast than doughnuts? I’ve made a few batches and now, because of this marvelous invention, my kids think my doughnuts are WAY better than the “Dunkin” kind. Please don’t ask them about the “Krispy” kind because I don’t want my kids to have to lie to keep from wounding my fragile ego. Nothing compares with “Krispy” in their eyes. Who can blame them? Paper hats and watching the doughnut conveyor belt is hard to beat. Plus that ginormous “hot and ready” sign won’t fit in my tiny kitchen. I can barely turn around in it without getting a bruise from bumping into something. Sorry, must be the sugar buzz getting me off track again. During one of my guilty pleasure shows, The Real Housewives of ANY CITY, one of the husbands was drinking a Moscow Mule. I recently had my first one at a supper club and LOVED IT! Not sure that I would because I am not a huge fan of ginger, but since my Paleo Challenge, my taste buds have changed and I actually enjoy the taste. Not huge spoonfuls but any small amount is an improvement. My trainer will get on me for using doughnut and Paleo in the same sentence! With my new found “like” of ginger, I thought about putting the flavors of a Moscow Mule into a Moscow Mule doughnut hole. Much like a rum ball, only BETTER! 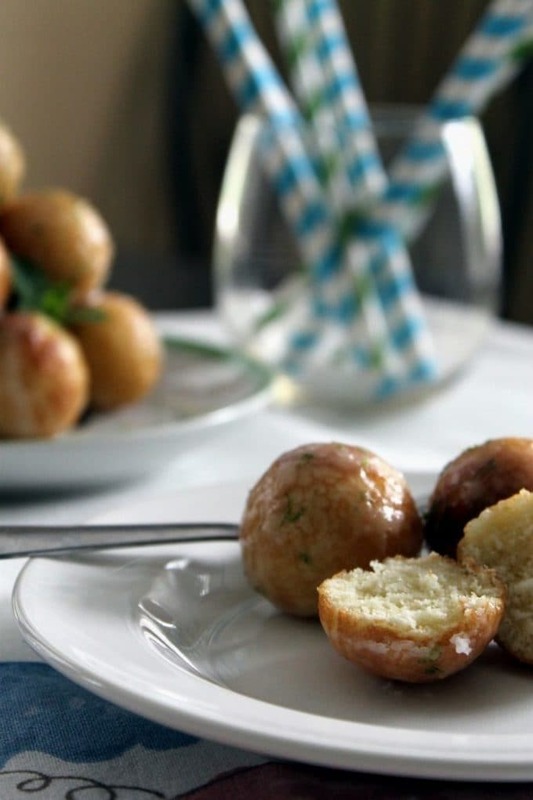 These Moscow Mule Doughnut Holes are amazing! 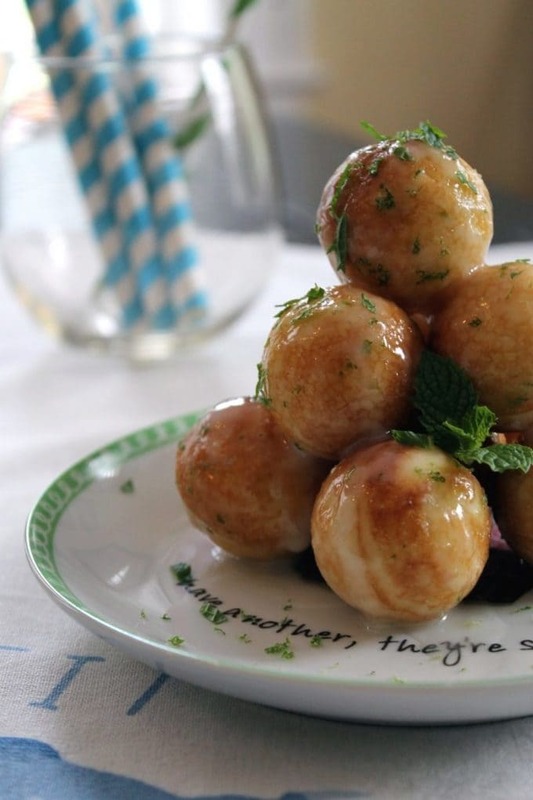 The fluffy texture of the doughnut holes rolled in the bright glaze full of ginger, lime, and mint. Perfect for eating right along with a Moscow Mule cocktail! 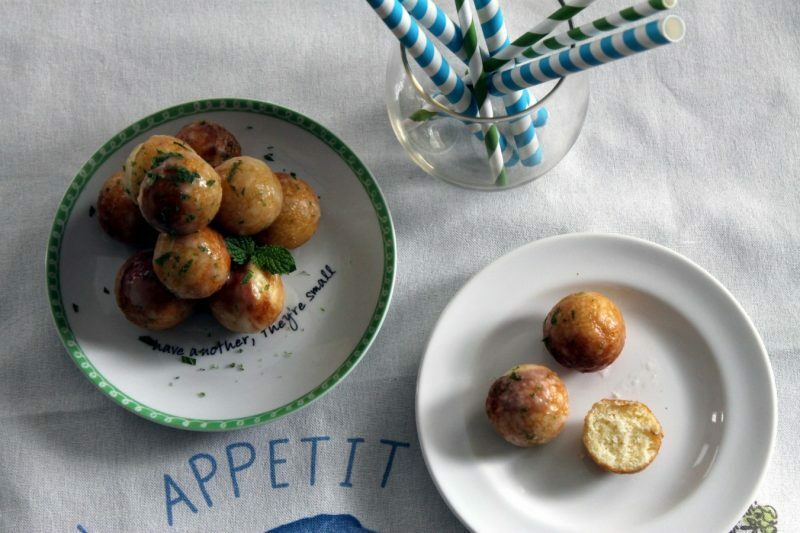 Here is my recipe for Moscow Mule Doughnut Holes! Sorry, I didn’t have the cool copper mug to take the picture with but when I actually get one, I’ll retake the picture. Maybe I will even start a glassware garage if I haven’t run out of closets by then. These Moscow Mule Doughnuts are little bites of heaven with the flavors of ginger, lime and mint will remind you of drinking a Moscow Mule! Preheat your doughnut hole/cake pop maker. If you do not have one, feel free to use a mini muffin pan and your oven at 425F. Spray with non-stick spray or grease how you normally do. Combine all the wet ingredients. Slowly combine the wet ingredients into the dry ones and stir just to combine. Do not over mix or the doughnuts will be tough. Add the recommended amount to doughnut hole maker or if you are using the mini muffin pan, fill 3/4 full. Bake according to instructions (5 minutes in doughnut hole maker) or 10 minutes in the oven. Combine the milk, powdered sugar, vodka, mint, and lime zest. Whisk to remove all the clumps. Roll in glaze and let sit on a cooling rack to catch excess glaze. 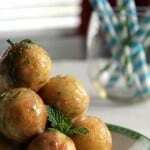 Sprinkle with lime zest and mint for garnish. You just took doughnut holes to the next level. These look wonderful. But seriously? 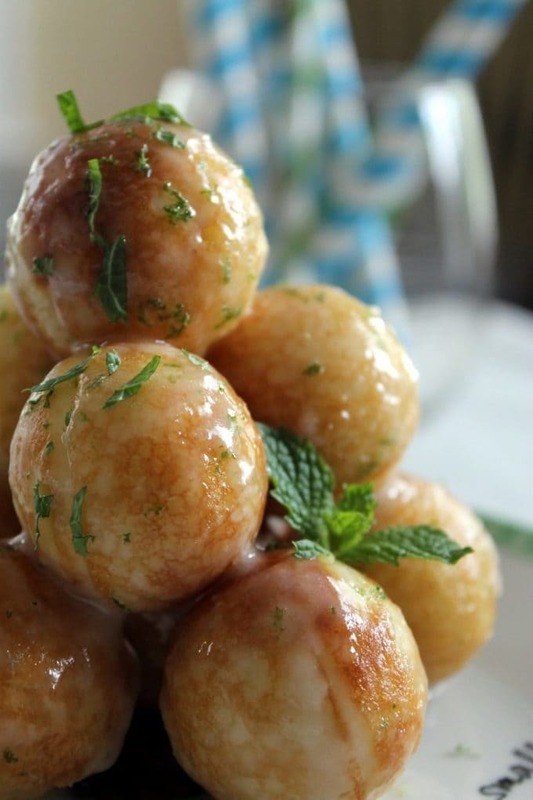 these doughnut holes look amazing!! When I buy a Doughnut hole maker, this will be the first thing I make. Thanks Hirra! So glad you stopped by! I don’t think I’ve ever had a Moscow mule, but think I would like it, I love all these flavors and these donuts sound incredible! Wow Your doughnuts look delightful and love your photography! These look amazing! I never knew you could could donut hole makers, might have to get me one of those. Thanks Faye! I have a whole closet for my small appliances since I have limited counter space. Doughnut hole maker was a gift and I have been thankfull ever since. Let me know how you like them when you get a chance to make them! Enjoying vicariously… I can’t remember the last time I had a donut… these look delish! Holly, I made these while I was taking a break from Paleo and thoroughly enjoyed every bite. I haven’t had one since but still remember their taste! Thanks for stopping by!